The item A european life, Michael Tracy, (electronic resource) represents a specific, individual, material embodiment of a distinct intellectual or artistic creation found in Austin Public Library. 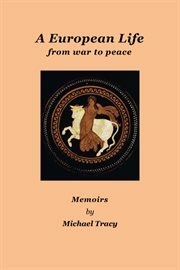 Michael Tracy's "Memoirs" recount his experiences from boyhood in wartime Scotland, through his life in "public school" and university, to postings in various international organizations and a senior position within the European Union in Brussels; then to involvement in Russia and other Central/European countries in the 1990s. The book concludes with an assessment of current issues facing both the EU and Russia; also, Britain in its relations with the EU...Michael Tracy grew up in Scotland during the war of 1939-45. After gaining scholarships to Fettes College in Edinburgh, then to Cambridge University (studying Modern Languages, then Economics), he worked in international organizations and for ten years was a Director in the Council Secretariat of the European Union. He also pursued an academic career, writing on agricultural policy and economics and lecturing in various European universities, including Wye College in England and the College of Europe in Bruges. In Moscow in 1991, he witnessed at close quarters the collapse of the Soviet Union, and subsequently was involved in a new institute in St. Petersburg. Subsequently he had advisory and teaching roles in the countries of Central/Eastern Europe during their transition to market economies and accession to the European Union. His final chapter assesses the issues currently facing both the European Union and Russia. Taking the story up to May 2010, it discusses the prospects for the euro zone, and the implications of Britain's new coalition government for Britain's relations with the EU (a subject that he has followed from the outset in the late 1950s). This is not a history: it is a personal, lively, and often humorous account of Michael Tracy's experiences, in which personal contacts figure largely. Nor is it a tract for or against the European Union; on the other hand, it sheds a more human light on proceedings in "Brussels"